Katie began riding when she was 5 years old. 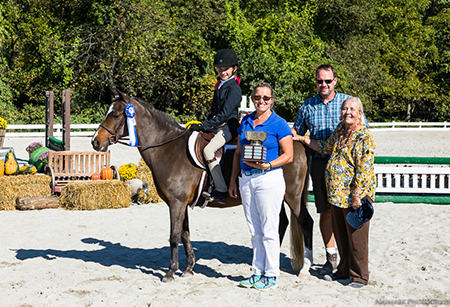 During high school, Katie competed in equitation and hunters with her horse "Chase the Blues". 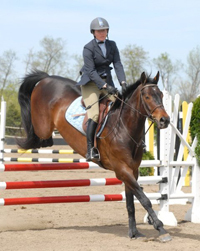 During college, Katie rode on the Smith College Riding Team and was captain her junior and senior year. 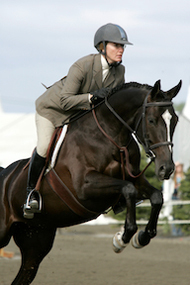 During the summers of her college years, Katie rode with Robin Fairclough and trained for the jumpers. After purchasing "Hidden Secret" in January of 1995, Katie began showing in the Marshall and Sterling Adult Jumper League. Katie qualified for M & S Nationals at the Washington Horse Show in 1996, 1997, and 1998 and came home with a fifth the one year and a third the last. Even though Katie became a computer consultant after college, she found time to ride in the evening and compete on the weekends. When the opportunity came to show in Wellington, Florida for the winter, Katie took a leave of absence from her job and found her true passion was working with horses. 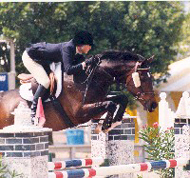 During the winter of 1999, Katie and Hidden Secret were very successful in the Amateur-Owners Jumpers, winning the Amateur-Owner Grand Prix and the Grand Championship title two weeks in a row. Upon returning back to New Jersey, Katie decided to purchase her own farm. 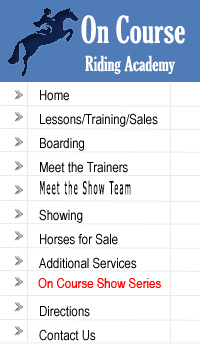 The opening "On Course Riding Academy" was in May of 1999. Since then Katie has expanded her business and career. Katie competes regularly in the Jumpers and Hunters. One of her highlights was placing 3rd and 7th in the Gambler's Choice class at Garden State Show in May 2004 and she also competed with two horses in the Mini-Prix at the Princeton Show Jumping Classic in October of 2004. Katie has also been successful as a trainer. In 2004, Amanda Moffet and her pony, Rosmel's Star Struck, were end of the year Champion for Short Stirrup Equitation and Short Stirrup Hunter at the Smoke Rise and Snowbird, and ranked within the NJHSA and NJPHA. 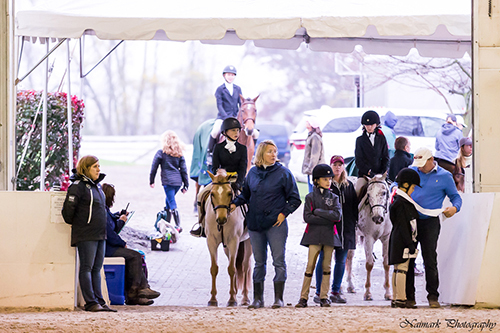 n 2006, Kim Beattie and Amanda Moffett qualified for M&S finals for Children's Hunter and HBO Children's Equitation, as well as, Zone 2 Finals. Kim Beattie and Albuquerque were Horse of the Year at Snowbird, Champion for End of the Year Awards at Snowbird, Sussex County Benefit and Smoke Rise. She finished 2nd in Zone 2 Children's Hunter Horse Olders. Currently, she is training an excellent string of Hunters. LeeAnn Swenson's Liberator, Amanda Moffett's Spontaneous and Kianna Luscher's A Patch of Luck are consistently Grand Champions. In December 2003, Katie decided to expand the facilities.In July 2004, the 80' x 184' indoor and a seven stall barn were complete. In December 2009, and additional barn was added to the show facility. Since Katie and her students are a mixture of Hunters and Jumpers, an outdoor ring was created for each. Katie is certifed American Red Cross CPR and First Aid and is pursuing her USHJA Trainer's Certification. Gina Jacobsen is our resident professional rider. From breaking babies to competing in Hunter Derbies, Gina is very successful in getting the most out of all of her horses. She has a quiet confidence and is very brave. Her work ethic and loyalty to the sport are among the best. Does Katie live on the property? Yes, Katie and her husband live in a house that overlooks both barns and has a view of every paddock. Is the stable closed on Mondays? No, we are open 7 days a week, 365 days a year, from 7AM to 10 PM. Do the horses get led in and out of the paddocks by themselves? Yes, for safety reasons, all horses are led by themselves in and out of the paddocks. Is there a set feeding schedule? Yes, the horses are grained exactly the same time everyday. Do you have a lot of ticks? No, because we keep our fields mowed and are not surrounded by woods, we have had no problems with ticks. Can my horse have individual turnout? Yes, horses are turned out individually or with a partner, depending on the owner's request and the horse's ability to get along with others. Do you turn the horses out in the rain? No, on rainy days, the horses stay inside. Am I required to take lessons? Are the rings dragged daily? Yes, the rings are dragged daily with a parma groomer. Yes, both barns have restrooms. Is there an extra charge for supplements given both AM and PM? No. We highly recommend using SmartPak for more than one supplement at each feeding. Does the wash stall have hot water? Yes, both wash stalls have hot/cold water. Can I bring a tack trunk? Yes, there is plenty of room for a standard tack trunk. Can I lunge my horse in the indoor rings? Yes, lunging is allowed in both rings, as long as, no one is riding. Do you charge extra for bringing a horse in from the field for the vet or farrier? No, but please advise Katie of any scheduled appointments. Yes, $10 for a full load, $5 for a half load. Yes, we accept VISA, Mastercard, VISA debit, and Mastercard debit. Are the paddocks picked out? Yes, the paddocks are cleaned on a regular basis. Do you have a heated indoor? Yes, the 70' x 100' indoor is heated. No, worming is included in board. Horses are wormed every 6 weeks with a rotation of Strongid and Ivermectin. Are all of the horses on the facility up to date on vaccines and current coggins? Yes, it is required to have a current coggins (with a year) and Flu, Rhino, EWT in the fall/spring and Rabies annually.